Unpack the replacement M.2 mezzanine and place it on an antistatic mat. If required, ensure that you have installed the M.2 flash SSDs on to the M.2 mezzanine before installing the mezzanine on to the PCIe riser. See Install an M.2 Flash SSD. 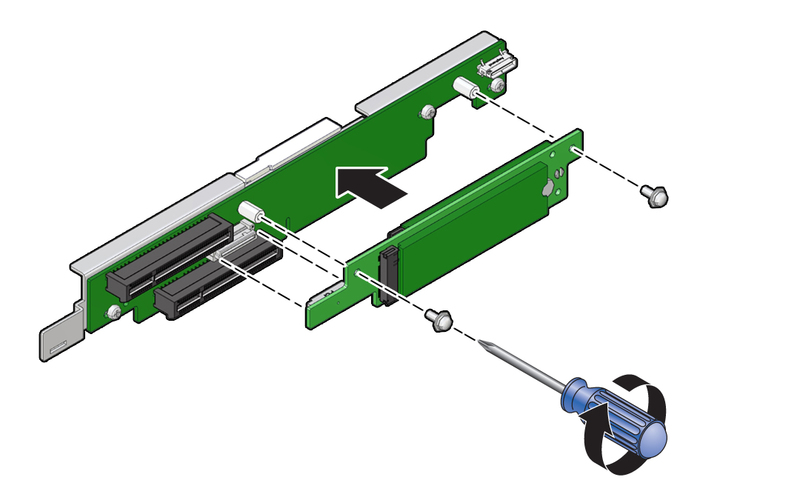 Align the M.2 mezzanine with the connector and screw holes on the PCIe riser and then insert the mezzanine into the connector. Using a T10 Torx screwdriver, install the screws that secure the M.2 mezzanine to the PCIe riser. Install the internal HBA card in PCIe slot 4 and any PCIe card in PCIe slot 3. See Install the Internal HBA Card and HBA Super Capacitor and Install a PCIe Card in PCIe Slot 3.